Thank you for considering sponsorship of the Cornell Cycling Club. Your support allows us to continue racing at a high level during the 2012–2013 season. In return, you can expect that we will represent the club and promote our sponsors to the best of our ability. Cornell Cycling consists of over 100 cyclists associated with Cornell University, including undergraduate, graduate and professional students. Membership ranges from casual riders to dedicated racers, with the club fielding a team in the Eastern Collegiate Cycling Conference for road (spring), cyclocross (fall) and mountain biking (fall), as well as non-collegiate races throughout the year. We’re redesigning our team uniform this year, so now is an excellent time to secure prime placement for your organization’s logo for the next three years. 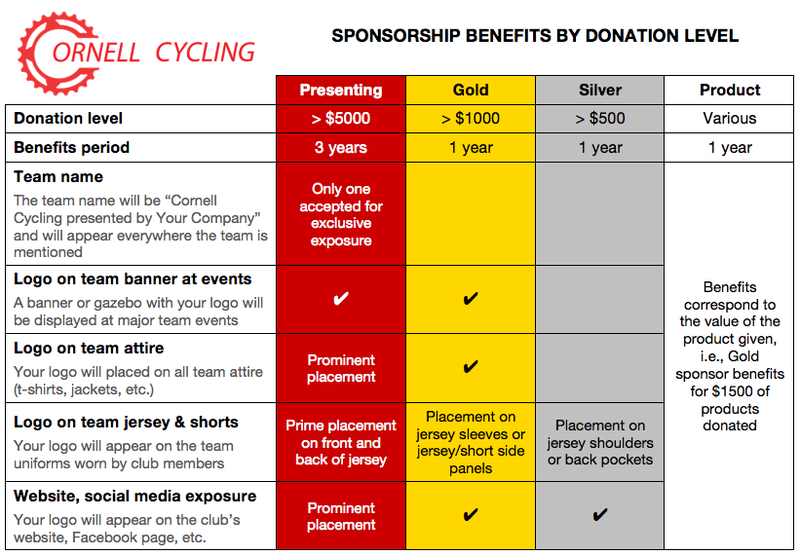 There are opportunities to support Cornell Cycling at several levels. Please contact the club president, Micah Lerner ’13, mal338 [at] cornell.edu, with any questions or to finalize sponsorship arrangements. Cornell Cycling wouldn’t be possible without the generous funding and support of our corporate sponsors, alumni, family and friends. Thank you for everything you do to keep us in the race.